Each “25th” set will be curated and performed by the original artists, including Mary J. Blige’s My Life, Nas’ Illmatic, Brandy’s Brandy, Scarface’s Diary, Big Daddy Kane’s Daddy’s Home, Da Brat’s Funkdafied, Slick Rick’s Behind Bars and Brownstone’s From the Bottom Up. Kicking off Friday night are marquee performances from some of music’s biggest acts including Missy Elliott, RBRM (Ronnie, Bobby, Ricky, Mike) and more; opening night will also include a 25th anniversary set presented by Doug E. Fresh that will feature Brandy, Ledisi and Sheila E., MC Lyte, Morris Day, Former Members of New Power Generation, among others. Saturday night is anchored by Mary J. Blige, Nas, H.E.R. and more, with 25th anniversary celebrations by some of the most influential names in hip-hop, including Big Daddy Kane, Scarface, Slick Rick and more. Closing night on Sunday will feature a performance by Maze featuring Frankie Beverly with a special tribute to Frankie Beverly delivered by Anthony Hamilton; Jermaine Dupri’s Atlanta-focused curation with performances by Musiq Soulchild, Da Brat, Lil Jon and Dem Franchize Boyz; Teddy Riley’s Legends of Music curation that includes Pharrell Williams, Timbaland, Teyana Taylor, MAJOR., Ro James and more; as well as a NOLA-style bounce performance with Mannie Fresh and Big Freedia. Each night will be hosted by Loni Love and will feature music by DJ D-Nice. 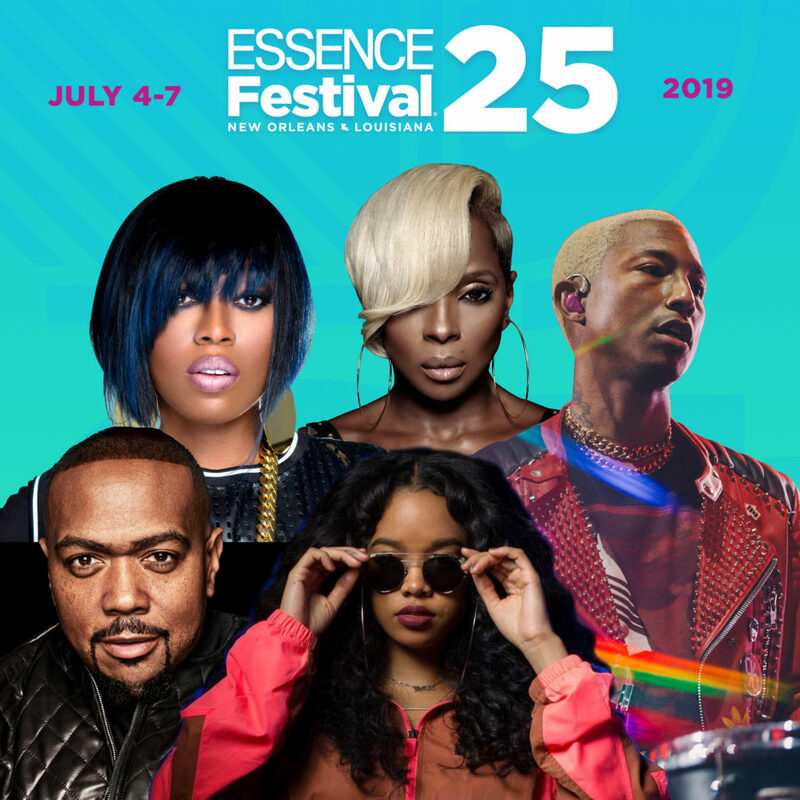 The ESSENCE Festival takes place July 4-7, 2019 in New Orleans, LA. You can view the official night-by-night line up here. Single night ticket are on sale now. The ESSENCE Festival is sponsored by Coca-Cola, AT&T, Ford, State Farm and Walmart.